Another Europe is Possible is proud to be playing a central role in the Stop Trump coalition. You can view its website and pledge to support it here. Founded in February 2017, the Stop Trump coalition has already brought tens of thousands of people onto the streets to oppose the #MuslimBan and the politics of hatred and division. The Coalition aims to be broad and inclusive, and to put the voices of those most affected by oppression and bigotry front and centre of the campaign. When Donald Trump comes to the UK, we will organise the biggest demonstration in British history to oppose him – and a range of actions and activities across the country. 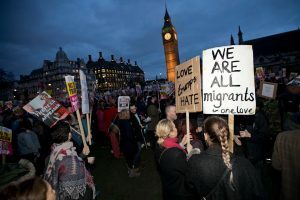 This movement is important to us because Trump and Brexit are two sides of the same coin – far right, anti-immigrant responses to deeply felt betrayal and disenfranchisement. We know that the answer to this situation is solidarity, compassion and social progress – not nationalism and racism.